Working capital should be differentiated from capital needed for expansion. Operating cash should not be used to fund business expansion. Q: I recently started a next-day delivery service using two bike messengers with minimum capital (P100,000) since I thought I could just roll over the funds I earn from the business. However, to cover more area, I think I have to buy more bikes and gear and hire two more messengers. My capital is fast running out. Would you advise me to go ahead with the purchase or just stick to what I have right now? A: Before thinking of expanding, observe how your business is doing, at least for the first six months. Determine if your business is capable of generating enough cash flows to sustain your operations. You may think that your business is sustainable because you experienced strong sales immediately after launching, only to realize later that it was mostly driven by seasonality. Monitor your actual performance, compare this against your budget, and make some adjustments. This way, you can anticipate your capital needs along the way. It is not easy if you will simply rely on existing cash flows for capital expansion because you will have liquidity problems later on if your cash flows suddenly weaken. Analyze the behavior of your operational expenses. Are your expenses and revenues meeting your projections? There may be some hidden expenses that you may not have anticipated, therefore not part of your budget. Find out what is causing this and identify ways to minimize them. Once you’re ready to spend for expansion, explore the new areas that you wish to cover. Investing in capital expenditures such as buying new bikes and hiring more messengers is like putting up another new business altogether. Evaluate every opportunity to expand. Use your existing business as your immediate benchmark. How feasible is the new market? How much revenue do you expect to achieve? 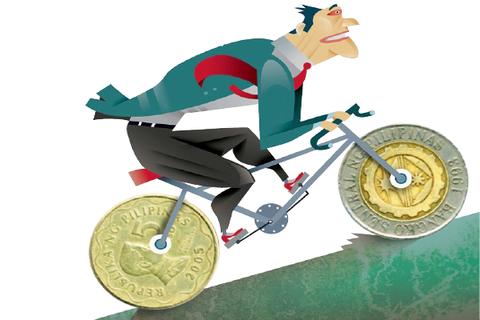 How much capital do you need to invest and how soon may it be recovered? Let’s say you have already decided to invest. Should you use your cash reserve? If your cash reserve is more than what you need in the business, you can use the excess to finance your expansion. The cash that you need for your business operation is what we call the working capital. This is the money that you use to pay for your monthly expenses, supplies and other operational needs. You get this cash back from collection of your receivables and cash payments from customers upon delivery. 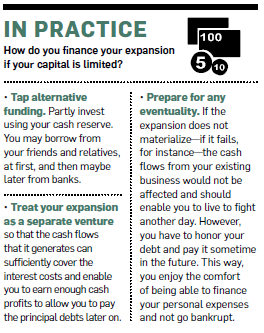 Be careful not to use your operating cash for expansion. When you do this, you will encounter frequent cash shortfalls to pay for your regular expenses. The cash that you took out from your working capital for fixed capital expenditures will not be easily and quickly recovered. Meanwhile, you will find yourself struggling with cash flows, and you may have to resort to borrowing and paying high interest costs. Many entrepreneurs, in their desire to expand aggressively, have fallen into this trap. Your business may be generating healthy cash flows monthly, but it doesn’t mean that you are financially capable of expanding. Your current cash flows may just be enough to pay for your monthly costs and to give you a decent salary for your personal expenses. The cash that you have been accumulating from profits may just be the buffer you need and not yet for serious capital expansion. Henry C. Ong, CMA RFP, is president and COO of Business Sense, Inc. (www.businesssense.com.ph ), a financial advisory and consulting firm. He may be reached at hong@businesssense.com.ph . This story was originally published in the May 2013 issue of Entrepreneur magazine.